Rheem Lazer instant boiling hot water, hot water dispenser, hot water urn, hot water heater or boiling water units keep water either boiling or near-boiling all year round. The Rheem Lazer white powder coat range range of boiling water units have been designed with today’s energy conscious user in mind. A timer allows you to program when boiling water is not required to turn the unit off for maximum savings, whilst a clever sleep mode senses when no one is around and powers down conserve energy. These features to save around 40% of the energy normally used and means Lazer meets BCA requirements for energy efficiency. With all of the features of the white powder coat models but in a stylish hard wearing brushed stainless steel finish and with only two moving parts (one of them being the tap) Rheem Lazer is more reliable than other boiling water units and is designed for heavy demand. 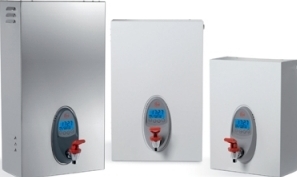 Electronic controls keep the Rheem Lazer instant boiling water unit water heater performing to a high degree of accuracy with the water temperature varying by only a degree or two. Rheem Lazer hot water urn can take the heaviest usage, and deliver boiling water even as it is refilling. Rheem Lazer is suited to any application: canteens, clubs, hospitals, commercial kitchens, offices. It is a winning combination of style, performance and efficiency. Rheem Lazer is easy to install by Flo-Rite Plumbing’s licensed plumbers as these units plumb directly to cold water and may be connected to any approved standar electrical wall socket. A large range of models from 2.5 litres to 40 litres, which provide up to 410 cups in the first hour. High efficiency CFC Free insulation allows Rheem Lazer to operate economically. Easy to operate and safe to use, with simple electronic controls. Simple to maintain and service. Fully automatic – no manual filling. instant water heater and boiling water units.